Being socially bullied is the second most common form of bullying, after name calling. This type of bullying is also known as covert and relational bullying as it is designed to humiliate and damage someone socially. In our national bullying survey, 55% of young people surveyed have experienced social bullying. Of those who have been cyberbullied, 36% were left out on purpose and 51% had false rumours spread about them. It isn’t easy for someone going through this to accept when the line crossed from being a prank or banter to persistent bullying. By the time you realise it is bullying, it may feel harder to seek support. When you are faced with social bullying, your first instinct may want to isolate yourself and withdraw from all social situations, online and face to face. This is a natural emotion as you are trying to protect yourself from harm. Emotionally, your self-esteem and confidence might be taking a knock and you may be experiencing anxiety and depression which can have a serious knock on your emotional and mental health and well-being. Another emotion you may feel is anger and this may develop into aggressive behaviour. The anger and frustration can feel destructive so getting help is important. All of these emotions are a process, it is a journey that you go through to help you understand how your feelings. It is important to try and speak to an adult you trust, such as your parents, a teacher or a relative perhaps. Seeking support can help you gain the strength you need to get the bullying stopped. Attention seeking behaviour, doesn’t matter if it is positive or negative. Might be a need for them to think they can get what they want from being a bullying. To punish people they are jealous or envious of, so targeting them for bullying. Because others are doing it and they too afraid to speak up. They may have low self-esteem, confidence and possible anger issues. Whatever the reasons may be, it does not give anyone the right to make others feel low or bully others to make themselves feel better. If you're worried your behaviour could be described as bullying, please see tips from The Buzz on making better choices and how to stop. Trust your instincts – Friends that care will never bully! The ones who do, were never your friends in the first place. See the bigger picture – Easier said than done but just remember those who are bullying may have issues and although this is no excuse, it may be a reason as to why they are choosing to act this way. Ask for help – Asking for help to get this stopped is not a weakness, even having someone to talk to can help enormously! Get your loved ones on board. Get involved - Join a group that offers activities that you really like and that give you a chance to shine. You might even want to use your experiences to set up a peer support group for those who are being bullied. Be yourself – Don’t let the small minded actions of other dull your shine. Be kind, be confident and love who you are. The bullies will soon get bored when they don’t get a reaction. 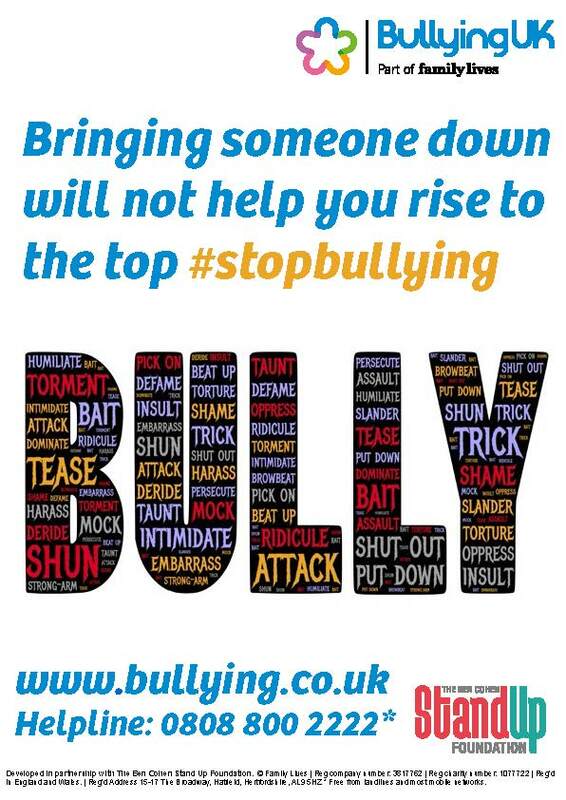 Please download our free social bullying poster by clicking here.